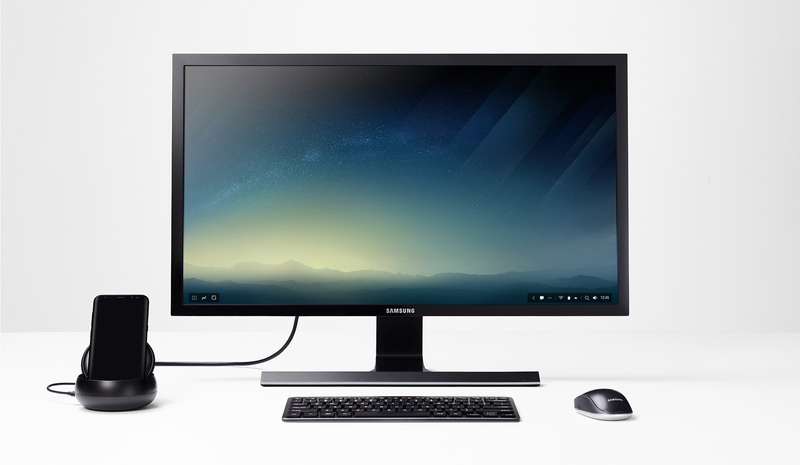 Samsung DeX Station, allows owners of the Samsung Galaxy S8 or Samsung Galaxy S8+ to plug into a Samsung DeX Station wired to a desktop monitor, then have a full desktop experience powered by Samsung's Galaxy S8 or Samsung Galaxy S8+ smartphone. The Samsung DeX Station features two USB 2.0 ports, ethernet port, USB Type-C power in and a cooling fan. Samsung DeX Station also features Adaptive Fast Charging allowing for fast charging your Samsung Galaxy S8 or Samsung Galaxy S8+ while connected. Samsung is currently taking pre-order's for the Samsung DeX Station at $149.99 through the Samsung store and linked below at the source link. Shipping is currently scheduled for April. Detailed by Google, a bug was found in final testing for an array of Android Wear devices therefore delaying Android Wear 2.0 for all eligable device with the exception of the Fossil Q Founder, Casio Smart Outdoor Watch WSD-F10, and Tag Heuer Connected Watch. Here’s the statement from Google that was provided. Samsung today announced the Galaxy S8 and S8+ its flagship smartphones for 2017. The Samsung Galaxy S8 and Samsung Galaxy S8+ adopt what Samsung calls its Infinity Display. Infinity Display moves from the industry standard 16:9 aspect ratio to a taller 18.5:9 ratio with 2,960 by 1,440 pixels. 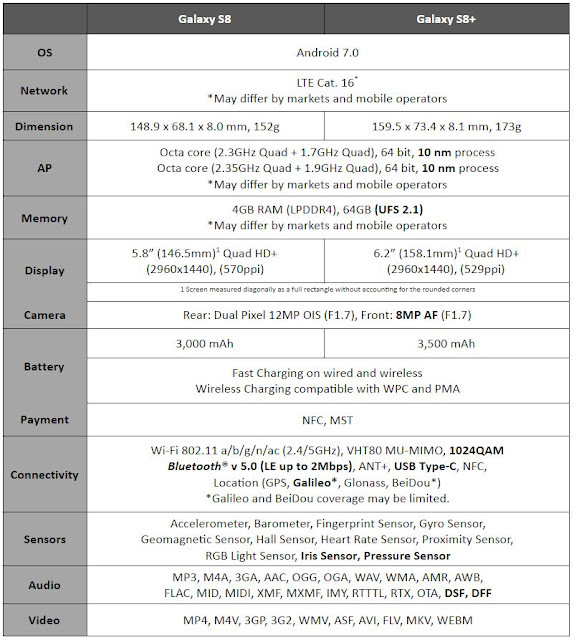 The devices share nearly all features other than screen size and battery capacity. Where the Samsung Galaxy S8 has a 5.8 inch display and 3,000mAh battery, the Samsung Galaxy S8+ has a 6.2 inch screen and 3,500mAh battery. The Samsung Galaxy S8 and Samsung Galaxy S8+ is first to see Samsung drop the physical home button that has been set at the front of its handsets in favor of on screen controls and a virtual home button that's unmarked in the area below the screen. This has allowed Samsung to reduce bezel size along the top, sides, and bottom edges giving the new flagship 83% display ratio. Samsung says the displays are mobile HDR certified and offer more room for multitasking. Core features include a Snapdragon 835 processors with 4 GB of RAM, 64 GB of storage, and SD memory card supporting a max SD card of 256GB. Both Samsung Galaxy phones are rated IP68 for protection against water and dust. Samsung has moved the front mounted fingerprint reader for an updated rear mounted fingerprint reader, front mounted iris scanners, as well as wireless and rapid charging. The main rear facing camera has a 12 megapixel sensor with optical image stabilization and an aperture of f/1.7 while the front camera has an 8 megapixel sensor and boast an aperture of f/1.7 with autofocus and face detection. Ports include USB-C and 3.5mm headphone jack. 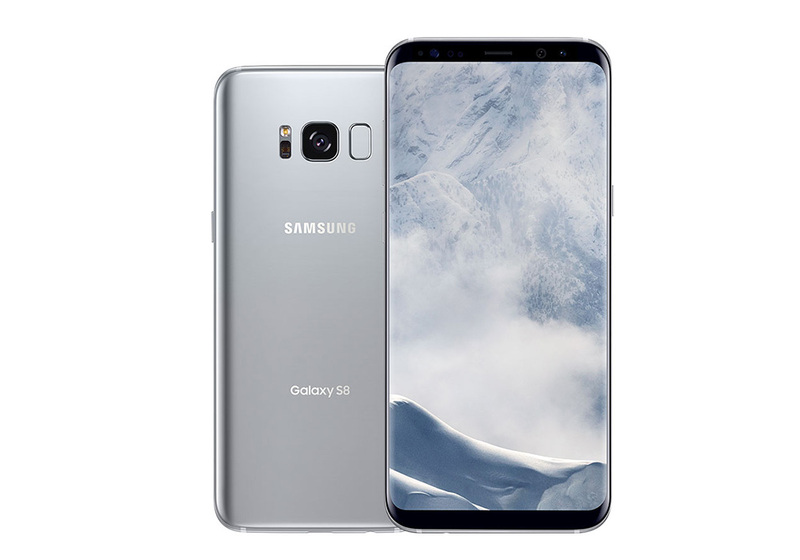 The Samsung Galaxy S8 and Samsung Galaxy S8+ are run Android 7.0 Nougat at launch along with Samsung's new Bixby voice enabled user interface, and comes with improved Samsung Health, Samsung Connect, and Samsung Knox apps preinstalled. The U.S. version will come in black, silver, and purple. The Samsung Galaxy S8 and Samsung Galaxy S8+ is expected to go on sale next month, with pre-orders live. Pricing will be set by carriers. Google Outs Google Family Link Early Access Program Starting Today. Google is working on providing a more child friendly experience for Android. Launching as invite only Family Link allows parents to control what apps children can use on managed devices as well as set screen limits and usage locks. The Family Link apps allows parents to create a managed Google Account for their child. Installing the app and signing into that account on an intended device will present parents with several management options. Parents have full control over what kids can download from the Play Store, while being able to track how much time is spent in those apps. Reports show usage on weekly and monthly increments. There are also daily screen time limits as well as a more general device bedtime that remotely locks devices after set hours. The Android 7.0 or higher requirement is a notable limitation given how relatively few devices are currently running Nougat. Additionally, tablets which parents are more likely to give to young children than phones have yet to widely see the latest version of the OS. Parents in the US can request an invite to the Family Link early access program starting today by hitting the source link below. Google will ask early users for feedback on how to improve the experience before rolling it out to all.